Out North proudly presents, “We The People?” in the gallery, and Mossnova as the band makes its radio debut on KONR . “We The people?” is a photographic study of the hands of those lost and forgotten in our community. The images are coupled with handwritten messages by homeless members of our community. The exhibit by photographer Mikey Huff is a reflection of a marginalized part of the community, the exhibit asks basics questions about our perceptions of others, our common humanity and our responsibility to one another, the collection not only provokes conversations and reflection, but also challenges viewers to effect change. “We The People?” is part of The Wool Socks Project, according to Huff, the project is “Serving the Anchorage homeless community, our intent is to help each individual we interact with in some small way, whether it be with our care packages (wool socks, gloves, food, hand warmers, etc.) 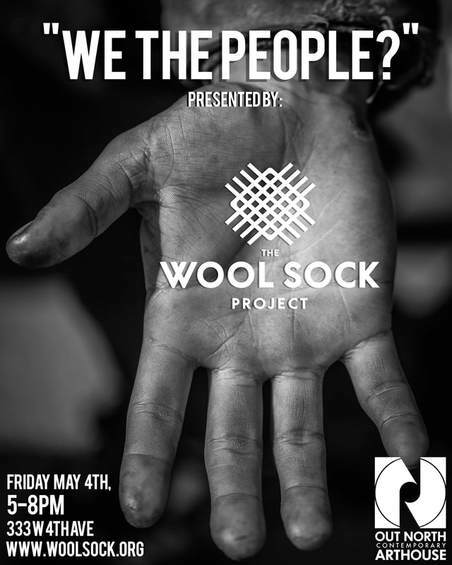 or simply by shaking hands and sharing stories.” The Wool Sock Project is a collaboration between Huff and the Anchorage Downtown Partnership. Opening reception: Friday, May 4 2 from 5:30-8:00 pm, 333 W 4th Avenue, Anchorage AK 99501. Gallery hours: Saturdays from 12-4 pm or by appointment. Anchorage-based Mossnova makes its radio debut in the lead up to their EP release this June. Join us for a free live performance in the KONR-LP Studio in downtown Anchorage - 411 W. 4th Ave. Despite drawing influence from the psychedelic rock sound of the past, Mossnova puts forth a distinctly modern sound. This four-piece band offers wavy synths, trippy guitar solos, with a little dose of funk. Can't make it downtown? Tune ye ol' radio dial to 106.1FM in Anchorage to listen live.7pm, with the performance starting at 7:30pm.